Lasagne and cannelloni dishes are pretty much my ultimate in comfort food, so this baked Italian dish which uses stuffed savoy cabbage leaves instead of pasta is a total winner. The stuffing of ricotta, Grana Padano and Prosciutto di San Daniele is packed full of flavour, whilst the rich tomato sauce brings the comfort factor. 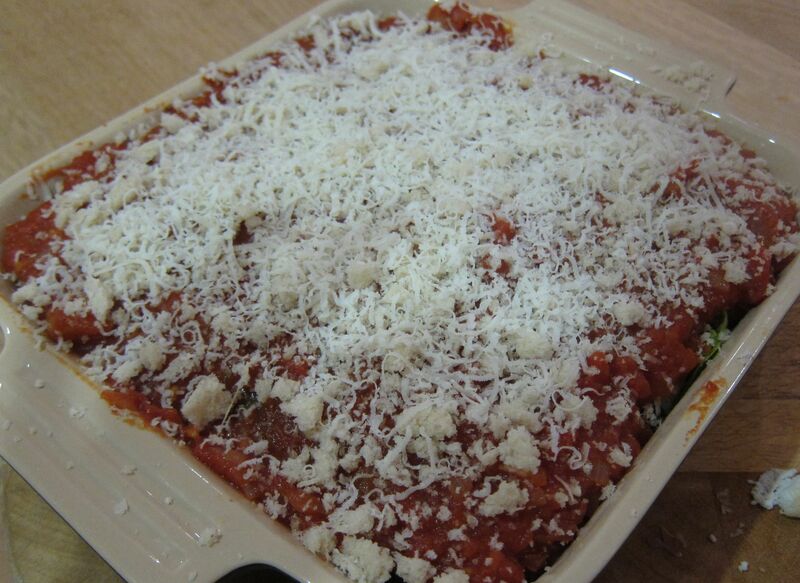 If you’ve got some day-old bread lying around then sprinkling breadcrumbs on top adds crunch for texture. As always with Italian food, using good quality produce will make all the difference so buy the best ricotta you can find (I used buffalo ricotta), and Italian chopped tomatoes. Start by making the tomato sauce. Heat the olive oil over a medium heat and soften the chopped onion and garlic for around ten minutes. Season well with salt and pepper whilst cooking. Add the tomatoes and wash out the cans with 100ml of water. Add this to the pan. Simmer for around 20 minutes, or until the sauce has reduced and thickened up. Check the seasoning and set to one side. Bring a large pan of salted water to the boil. 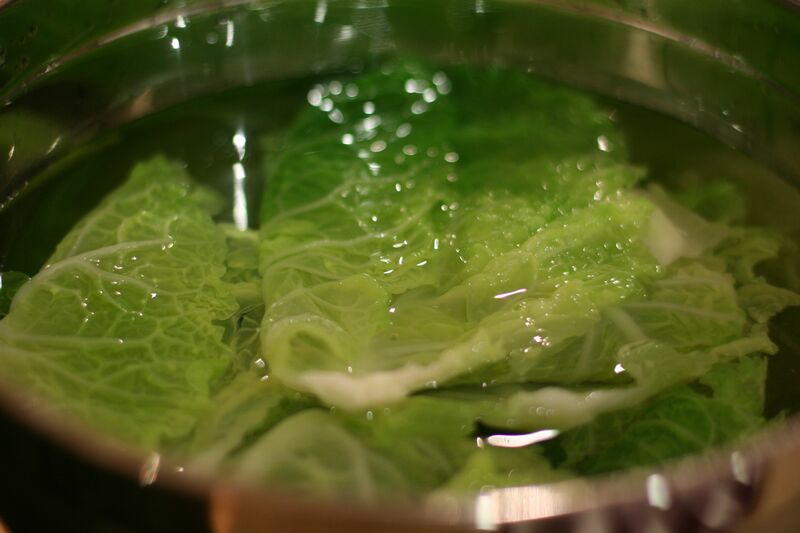 Cut the base off the cabbage and carefully separate the leaves discarding the first three or four tough dark green ones. Drop in ten or so leaves and boil for around five minutes until softened in the middle part of the stem. Remove the leaves with tongs and put into iced water to stop the cooking. This will help to keep the bright green colour too. After a couple of minutes remove from the water and lay to drip-dry onto a tea towel. Preheat the oven to 180°C. Meanwhile mix the cubed Prosciutto di San Daniele and other ingredients together for the stuffing. 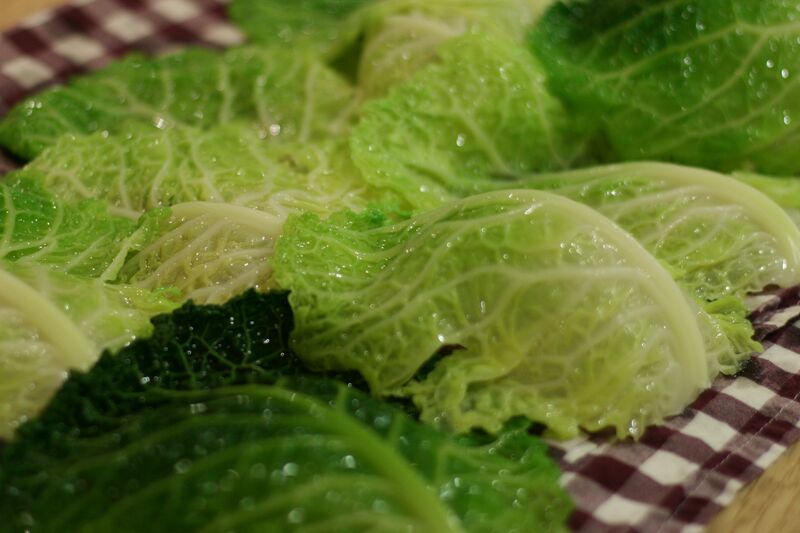 Cut a triangle out of the bottom of each cabbage leaf and make little slits with a sharp knife along the thickest part of the backbone of each leaf. Put a tablespoonful or so of stuffing in each leaf and start by folding in the outside leaves in and then fold over the stem end. Roll up with the thinnest part of the top of the leaf on the outside. If any leaves break, double wrap them using another leaf. Continue until the stuffing is used up. 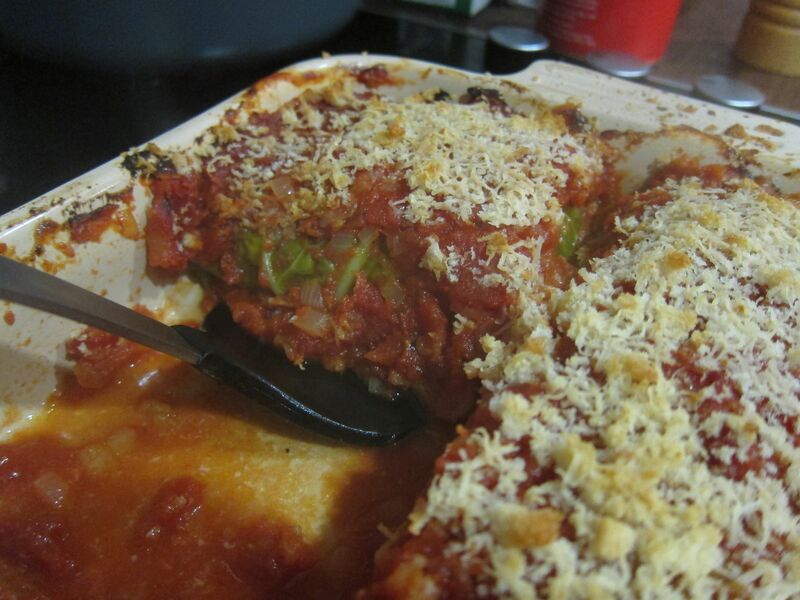 Pour a layer of tomato sauce onto the bottom of a lasagne dish. 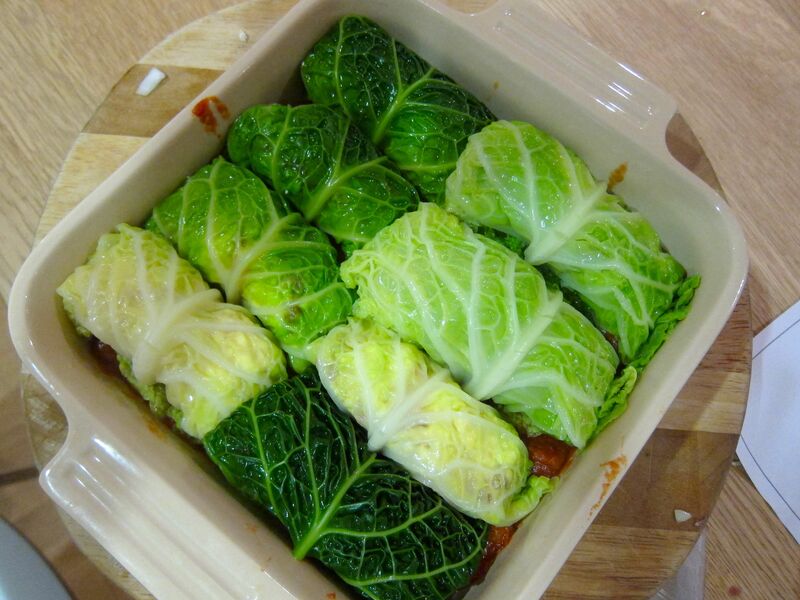 Put the cabbage rolls in a single layer on top and then pour over the rest of the tomato sauce. 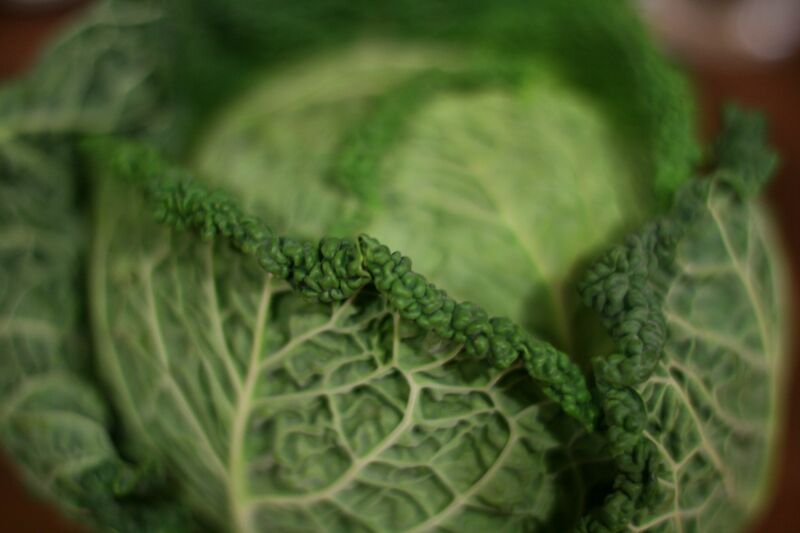 Scatter over the breadcrumbs and the remaining Grana Padano and bake in the oven for 30 minutes or until the cabbage leaves are cooked through and the top is golden brown. This post was sponsored by Consortium of Prosciutto di San Daniele and Consortium of Grana Padano Cheese. What an unusual recipe. I’ll give it a try! Yeah, mamma. You’ll definitely like it. Give it a whirl. 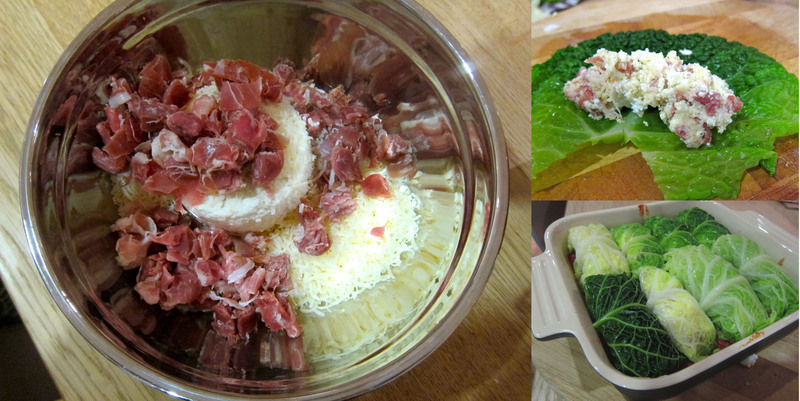 I’ve made a stuffed cabbage dish with rice and dill before but this one has CHEESE AND MEAT so therefore it wins. Yes, cheese and meat good. …and Sven keeps asking me to cook it again, so it must be a winner! I think this may have just become one of my favourite foods. And I haven’t eaten it, yet. 10 POINTS! Just had a look at the long range weather forecast and after what Iv’e seen I think it’s time to hit the comfort food. Just nipping out to get the ingredients while the weather’s still decent.